It was to be a Julia Child Christmas complete with the traditional Boeuf Bourguignon. Our family developed an interest in French cooking this summer. Gretchen and I read Julia and her nephew's book, My Life in France. We also read the book and saw the movie, Julie and Julia. Gretchen even purchased her own copy of Mastering the Art of French Cooking. Gretchen was a French major in college and is now a French language teacher, so the natural progression to learn all things French. We have always loved cooking and my son is an excellent chef, but now Gretchen and I are channeling Julia by wearing our pearls when we prepare food. It's a civilized thing to do! Son-in-law, Jeremy, was the chef and he took the cloak of responsibility seriously. The food gathering process was intense. Only the finest ingredients would be used. A trek to Whole Food ensured the freshest and finest of beef, mushrooms and pearl onions. We were in for a taste treat! He labored over the recipe and interpreted Julia's often vague instructions to create the finest result! Julia didn't believe in fast food and Jeremy stayed up until all hours to get it right, and it was superb! Such care is taken with each step of the preparation. Thanks, Jeremy! When Julia and Paul Child had dinner parties guests often wore a paper badge of sorts keeping in theme with the occasion. There is a famous photograph of them at Valentine's Day wearing paper hearts pinned to their lapels. For our party we each wore a paper Christmas tree complete with a shiny ribbon. What a festive idea! Smiles were all around the table. Thanks, Julia for that idea! 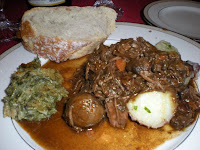 Our menu was rounded out with potatoes and crusty bread. Of course we also had some family holiday favorites of Spinach Madeleine and Christmas Salad. Aunt Donna contributed Blueberry topped Cheesecake and Lemon Meringue Pie which added to the decadence of the feast. The lemons for the pie came from the tree in Donna and David's back yard. How special is that? Gretchen also served her Gingerbread Men and Frosted Sugar Cookies...another labor of love. After a couple of cups of coffee, we moved on to the presents. When the children were small, their PopPop often teased them with a story of a fictitious Mary to whom he had given all their presents. Of course, he was teasing, but our little ones, Greg included, believed that Mary was there and had indeed taken the gifts. To this day, we tease that Mary will make an appearance to claim her gifts. Granny and PopPop are sorely missed at this time of year. Christmas was their favorite time of year and they were so lavish with their gift giving that they often made Santa look like a grinch. We continue the tradition of sharing gifts with each other. We have one grandparent left, my mom. She made the trip to Zachary with us and we were blessed to have her with us for this very special evening. Even though we are small in number, the gift to person ratio is large. The sheer pleasure of watching someone you love opening a package that was selected with love is heartwarming. Each gift symbolizes family love and dedication. We are lucky to have both. We missed Greg this year, but are hoping for a wonderful celebration with him in January. I am including the Spinach Madeleine recipe that is a Baton Rouge favorite. The original recipe called for Kraft jalapeno cheese (you know the kind that comes in roll) but this cheese is no longer available. There was actually a consumer revolt in Baton Rouge when this product was discontinued. But being Southerners, we adapted with some other flavors. I'll also provide you with the Christmas Salad recipe. A sorority sister of mine shared this recipe and you will enjoy it since the dressing can be made ahead and kept until serving time. The sugar combined with the balsamic vinegar gives it a kick! I believe that Julia would approve! 1. Cook spinach according to directions on package. Drain well and reserve 1/2 cup of the liquid. 2. In a medium saucepan, melt butter over low heat. Add flour, stirring until blended and smooth, but not brown. Add onions and sauté 3-5 minutes or until wilted. 3. Add evaporated milk, spinach liquor and Worcestershire sauce slowly, stirring constantly to avoid lumps. Cook mixture until smooth and thick, stirring constantly. 4. Add seasonings , jalapenos and cubed cheese. Stir until melted and combine with cooked spinach. 5. This may be served immediately or put into a casserole and topped with buttered bread crumbs. The flavor is improved if the latter is done and kept in refrigerator overnight. Reheat in oven on moderate temperature. Combine all and whisk together. Salad: Romaine lettuce, Spinach leaves, rings of purple onion, dried cranberies, walnuts, chopped Granny Smith apple, crumbled feta cheese. I enjoyed reading your posts. That Spinach Madeleine sounds wonderful. I have heard people complain that you can't get the Kraft cheese rolls anymore, but since I've never tried it, I won't know the difference!